What's the difference you ask? Well they are placing one organic result for the query above their "top" sponsored results, followed by the typical organic listings and then additional sponsored listings at the bottom of the page. This is a very interesting test on so many levels. The impact of this little SERP modification will have a direct impact on which results are clicked on. We know from our own Enquiro Research (as well as other industry data) that traditionally users click organic listings 80% of the time with 20% of the time users click on sponsored listings. In the past couple of years this has shifted slightly to where it is probably more of a 75-25 or 70-30 split between organic and sponsored. Has ASK taken this to heart and is now placing a relevant organic result in the prime real estate of their SERP? Have they done this to appease the 70-80% who click organic listings? Or conversely have they done this to set a new barrier on a search results page and somewhat force the user's eyes to now be more aware of the sponsored listings by placing them immediately after the top organic listing? How will this affect the clicks? We would expect that top organic listing to receive even more clicks, but will this de-value the organic positions two, three, four, five etc? Will users be more enticed to click on these sponsored results that directly follow the organic result? You'd have to think that ASK is "banking" on that fact from a revenue perspective in that they are hoping that more searchers click on the sponsored ads as that will in turn generate more revenue for ASK. But will they? Placing the sponsored ads below one organic result may in fact reduce the number of the clicks that those "top" sponsored results receive. As mentioned above, this may also have a negative impact on the remaining organiclistings on the page as well. 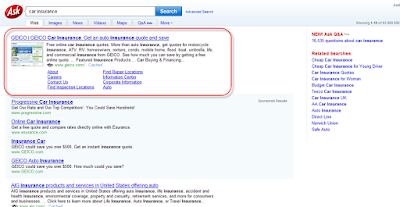 We tried a number of branded and non-branded queries in ASK and found examples of this new SERP layout with both. I cannot help to wonder if this is ASK's why of trying to improve the relevancy of their search results? I mean they still feature upwards of 10 sponsored links on their SERP, but hey if I see 20 results on a SERP (which is what you get with ASK - 10 organic and 10 sponsored) and the majority of the results are relevantto my query, there is a good chance that I will come back and use ASK again. We'll definitely have to monitor this to see how long ASK continues to roll out this new SERP layout. This could have a huge impact on the experience for the searcher.